We know that through early detection and individualized intervention, children with autism and other disabilities make significant progress. This spring, there’s a crafty and creative way families can help people living with autism. A.C. Moore Arts & Crafts, Inc. has teamed up with Easter Seals again for the third annual in-store campaign and crafting event that asks customers to Act for Autism® beginning March 25th through April 28th. Customers who visit any A.C. Moore (http://www.acmoore.com) store during the March and April timeframe will be able to donate $1 to Easter Seals’ Act for Autism campaign at checkout. 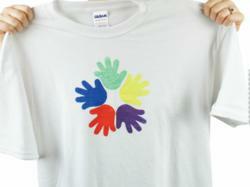 On April 21, 2012, from 1 p.m. to 3 p.m., all A.C. Moore stores will host a family t-shirt decorating event. With the on-site purchase of a t-shirt, customers will get to decorate it for free with a theme supportive of the Act for Autism campaign. The money raised during the campaign supports Easter Seals autism services in the same local communities as A.C. Moore stores, giving thousands of children and adults with autism access to critical services that help them live, learn, work, and play. Since launching the campaign as part of its Crafting a Better World program in 2010, A.C. Moore customers and store team members have raised more than $300,000 for Easter Seals. “Our campaign spans March’s National Craft Month and April’s National Autism Awareness Month and gives customers an opportunity to express their creativity and learn about autism, what are the signs, symptoms and support available through treatment for families living with autism” said Pepe Piperno, chairman of A.C. Moore. Today, one in 110 children are diagnosed with autism and there’s an increasing need for funding, services and support. There’s no known cause, cure or single effective treatment, but people with autism at any age can make significant progress and lead meaningful lives. Getting the right support at the earliest stage in life can help a child gain the skills he or she needs to be successful. “A.C. Moore and Easter Seals are a great fit—we’re able to combine our efforts to raise autism awareness, build community involvement and hopefully, inspire children of all abilities to find their inner artist,” adds Wright. With 134 stores along the East Coast, A.C. Moore Arts & Crafts, Inc. brings families together for fun through creativity. Named by Parents Magazine as one of the top 10 places for birthday parties, A.C. Moore offers a wide range of programs to engage adults and children in crafting, including workshops, demonstrations and “Make & Takes.” In addition to traditional craft products, A.C. Moore Arts & Crafts is also well-known for its selection of scrapbooking, jewelry, floral, yarn, fine art supplies, children’s crafts kits and educational toys, along with ready-made frames and custom framing. To locate your local A.C. Moore Arts & Crafts, visit us at http://www.acmoore.com, http://www.facebook.com/acmoore, twitter.com/officialacmoore and http://www.youtube.com/user/officialacmoore.